William Frederick "Buffalo Bill" Cody (February 26, 1846-January 10, 1917) was an American scout, bison hunter, and showman. He was born in Le Claire, Iowa Territory (now the U.S. state of Iowa), but he lived for several years in his father's hometown in Toronto Township, Ontario, Canada, before the family returned to the Midwest and settled in the Kansas Territory. Buffalo Bill started working at the age of eleven, after his father's death, and became a rider for the Pony Express at age 15. During the American Civil War, he served the Union from 1863 to the end of the war in 1865. Later he served as a civilian scout for the US Army during the Indian Wars, receiving the Medal of Honor in 1872. One of the most colorful figures of the American Old West, Buffalo Bill's legend began to spread when he was only twenty-three. Shortly thereafter he started performing in shows that displayed cowboy themes and episodes from the frontier and Indian Wars. 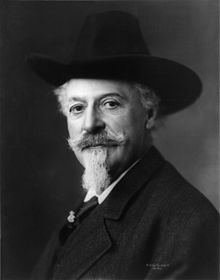 He founded Buffalo Bill's Wild West in 1883, taking his large company on tours in the United States and, beginning in 1887, in Great Britain and continental Europe. In Kansas, the family was frequently persecuted by pro-slavery supporters. Cody's father spent time away from home for his safety. His enemies learned of a planned visit to his family and plotted to kill him on the way. Bill, despite his youth and being ill at the time, rode 30 miles (48 km) to warn his father. Isaac Cody went to Cleveland, Ohio, to organize a group of thirty families to bring back to Kansas, in order to add to the antislavery population. During his return trip he caught a respiratory infection which, compounded by the lingering effects of his stabbing and complications from kidney disease, led to his death in April 1857. After his death, the family suffered financially. At age 11, Bill took a job with a freight carrier as a "boy extra". On horseback he would ride up and down the length of a wagon train and deliver messages between the drivers and workmen. Next he joined Johnston's Army as an unofficial member of the scouts assigned to guide the United States Army to Utah, to put down a rumored rebellion by the Mormon population of Salt Lake City. According to Cody's account in Buffalo Bill's Own Story, the Utah War was where he began his career as an "Indian fighter": Presently the moon rose, dead ahead of me; and painted boldly across its face was the figure of an Indian. He wore this war-bonnet of the Sioux, at his shoulder was a rifle pointed at someone in the river-bottom 30 feet [9 meters] below; in another second he would drop one of my friends. I raised my old muzzle-loader and fired. The figure collapsed, tumbled down the bank and landed with a splash in the water. 'What is it?' called McCarthy, as he hurried back. 'It's over there in the water.' 'Hi!' he cried. 'Little Billy's killed an Indian all by himself!' So began my career as an Indian fighter. At the age of 14, in 1860, Cody was struck by gold fever, with news of gold at Fort Colville and the Holcomb Valley Gold Rush in California, On his way to the gold fields, however, he met an agent for the Pony Express. He signed with them, and after building several stations and corrals, Cody was given a job as a rider. He worked at this until he was called home to his sick mother's bedside. Cody claimed to have had many jobs, including trapper, bullwhacker, "Fifty-Niner" in Colorado, Pony Express rider in 1860, wagonmaster, stagecoach driver, and a hotel manager, but historians have had difficulty documenting them. He may have fabricated some for publicity. Namely, it is argued that in contrast to Cody's claims, he never rode for the Pony Express, but as a boy, he did work for its parent company, the transport firm of Russell, Majors, and Waddell. In contrast to the adventurous rides, hundreds of miles long, that he recounted in the press, his real job was to carry messages on horseback from the firm's office in Leavenworth to the telegraph station three miles away. ...After his mother recovered, Cody wanted to enlist as a soldier in the Union Army during the American Civil War but was refused because of his young age. He began working with a freight caravan that delivered supplies to Fort Laramie in present-day Wyoming. In 1863, at age 17, he enlisted as a teamster with the rank of private in Company H, 7th Kansas Cavalry, and served until discharged in 1865. The next year, Cody married Louisa Frederici. They had four children. Two died young, while the family was living in Rochester, New York. They and a third child are buried in Mount Hope Cemetery, in Rochester. In 1866, he reunited with his old friend Wild Bill Hickok in Junction City, Kansas, then serving as a scout. Cody enlisted as a scout himself at Fort Elsworth and scouted between there and Fort Fletcher (later renamed and moved to Fort Hays). He was attached as a scout, variously, to Captain George Augustus Armes (Battle of the Saline River) and Lieutenant Colonel George Armstrong Custer (guide and impromptu horse race to Fort Larned). It was during this service at Fort Elsworth that he met William Rose, with whom he would found the short-lived settlement of Rome, Kansas. In 1867, with construction of the Kansas Pacific Railway completing through Hays City and Rome, Cody was granted leave of absence to hunt buffalo to supply railroad construction workers with meat. This endeavor continued into 1868, which saw his hunting contest with William Comstock. Cody returned to Army service in 1868. From his post in Fort Larned, he performed an exceptional feat of riding as a lone dispatch courier from Fort Larned to Fort Zarah (escaping capture), Fort Zarah to Fort Hays, Fort Hays to Fort Dodge, Fort Dodge to Fort Larned, and, finally, Fort Larned to Fort Hays, a total of 350 miles in 58 hours through hostile territory, covering the last 35 miles on foot. In response, General Philip Sheridan assigned him Chief of Scouts for the 5th Cavalry Regiment. He was also Chief of Scouts for the Third Cavalry in later campaigns of the Plains Wars. In January 1872, Cody was a scout for the highly publicized hunting expedition of the Grand Duke Alexei Alexandrovich of Russia.